The local blacksmith, Filnjar, will request your aid in clearing the mine of a large group of frostbite spiders. The creatures recently took up residence in the mine after the discovery of some unusual ore. The miners will return to work once it's been fully cleared. The mine entrance is located immediately west of Filnjar's House. A smelter can be found outside. Two veins on the ground on the bottom level. One vein on the ground on the descent just before the bottom level. Three pieces next to the smelter outside. It is possible to Whirlwind Sprint to the opening in the side of the mine wall just above the ramp. However, there is nothing of interest there, only a corpse suspended from the ceiling. 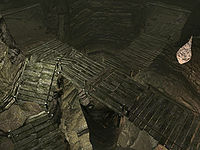 Despite printed literature and dialogue in game referring to this as an iron mine and the fact that Grogmar gro-Burzag will buy iron ore from you, the veins produce ebony ore. 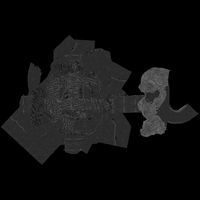 This issue has been addressed by version 1.2.6 of the Unofficial Skyrim Patch; it changes the interior ebony ore veins and the exterior loose ores to iron ore, swapped with Northwind Mine. Otherwise, Filnjar may have some iron ore for sale for completing the quest. The thick red iron mist described by the miners living in Shor's Stone is not present; the mine is clear inside. There are several desiccated corpses within the mine despite Filnjar stating that nobody had been harmed by the infestation. The frostbite spiders may respawn. See the quest page for more details.